Straight pop up displays make ideal branded backdrops that fit neatly in your event space without using up too much of your floor plan. Standard sizes reach to approximately 2.2 metres high and up to 5 metres wide, with custom sizes also available on request. These large pop up displays provide generous amounts of branding area for your custom messages and artwork – perfect for creating a back wall that not only attracts the eyes of passers by, but reflects your brands appearance in a professional manner that’s sure to impress. 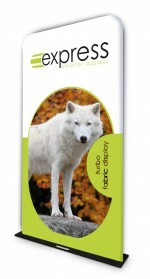 See our range of straight pop up displays today, or give us a call on 0808 163 6481 for more information. What is a straight pop up display? A pop up stand is made from a lattice structure frame, which can be packed down in a concertina fold. 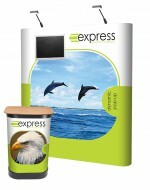 To complete the pop up display is a set of printed PVC graphics that attaches to the frame. What makes pop up displays straight, quite simply is the framework being straight. For added stability, stand feet can be fixed to the bottom of the frame. Choose from five sizes: 3×1, 3×2, 3×3, 3×4 and 3×5. 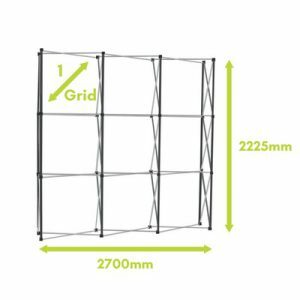 Don’t get confused, these numbers do not reflect a metric reference – rather they refer to the ‘grid’ size of the frame. As an example, a 3×3 straight pop up stand is three grids wide by three grids high. This is roughly 2700mm wide x 2225mm high. Custom sized frames are also available upon request. For more information on this, please call us. Where would I use pop up displays? Straight pop up stands are perfectly suited to fit neatly in corners or on the perimeter of your stand space. As they are straight in shape, you’ll be using the floor space available as efficiently as possible. Why choose a straight pop up display? Pop up displays may be large, but they’re extremely portable as well – ideal for the busy exhibitor looking for a stress free display to transport from event to event. Why are pop up displays portable? The lightweight concertina style frame when collapsed can fit into the supplied wheeled case (if bought as a kit) along with the graphic panels for stress free transportation. Even more, with a graphic wrap and counter top, you can fully transform the case into a branded event counter to use at your next exhibition. These contents are all available and included within the kit options. Screen mounts can also be added to your display. They are fixed onto any cross section on the top third of the frame. Adding a screen will give the ability to provide useful information to on-stand visitors, possibly when you’re too busy interacting with other people! There are certain screen weight and size restrictions so we recommend giving us a call to find out more. Replacement graphics are also available to be purchased as a set, without having to buy a new frame. This is ideal if you’re looking to refresh the messages on your display, or to simply change a seasonal message or offer. How easy is it to assemble a pop up display? The answer is very easy. 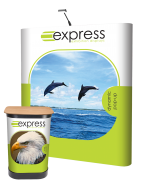 Exhibition pop up stands take less than five minutes to assemble with two people, or roughly 10 minutes with just one person. For speed of set up and convenience, we recommend using two people. Open the frame fully – magnetic connectors in the frame will join together. Attach the magnetic bars onto the frame. Hook the numbered PVC panels to the top of the frame, working from one side to the other. Carefully align the panels as you smooth down the graphic along the magnetic bars. Why use magnetic bars? The printed PVC graphic panels are lined with magnetic strips. This allows the panels to attach to the frame and create a seamless effect. Exhibition stands is what we do best. 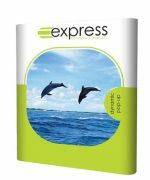 From custom sized exhibition pop up stands, to our standard sizes, we’ve supplied it all and we do so on a daily basis. For any custom requirements, or more information, please call us on 0808 163 6481 our use our live chat system during working hours.